Deep down in our genetic code is an instinct we still use every single day. Maybe not to the extent it was once needed—to ensure our survival—but in every decision we are faced with this one simple question. Our body tenses, waiting the response from our brain. Fight or Flight? Sometimes we choose wisely, sometimes not. What would you choose? 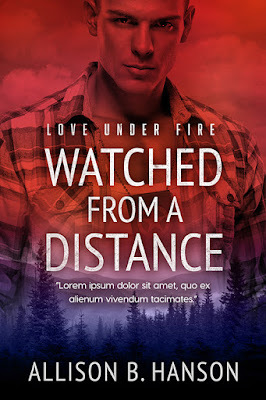 Let’s play Fight or Flight with Allison B. Hanson, author of Watched From a Distance. Scenario One: You’re down to the last sleeve of Thin Mints. You’ve been hoarding them in the back of the pantry because you know you only have those fourteen cookies to hold you over until next year’s cookie sale. Your husband has found them lurking behind the rice. Allison: Fight. When fighting for cookies you have adrenaline and dormant warrior goddess genes on your side. No matter how large your husband is, you will always be the victor when fighting for cookies. Never fear. Scenario Two: You’re writing a particularly delicious scene—you’ve just saved Jason Momoa from the bad guys and he’s feeling extremely grateful and a bit randy. But then, reality intrudes in the form of a family member calling you in that tone that could be anything from a loss of a limb or their inability to find the milk which is where it always is. Allison: Fight for Jason time. Launch into defense strategy. First, quietly close the door to the office. Maybe something heavy accidentally falls in front of said door. Second, put in earbuds so you can pretend you didn’t hear them. (Note: Make sure earbuds are plugged in.) If it’s the milk they will find it rather than hunt you down. If it’s the limb, you can drown your guilt with the last of the thin mint cookies. Allison: Stop right there. The answer is flight. Run as fast as you can in the other direction. The only time I might possibly consider fight is if I was backed into a corner, armed with a flamethrower, a lightsaber, and a 55 gallon drum of Raid. Maybe. Scenario Four: You live in the Northeast during winter and are out of bread and milk. A snowstorm has been announced on the radio. You are two minutes from the store. Allison: Flight. There’s no way there will be any bread left in the store by the time I get there two minutes from now. When the bread is gone, the pillagers will move to the Pillsbury dough and pre-made pizza crusts. Then things get ugly. As society breaks down and turns to tortilla chips and pitas you’re taking your life in your hands. It’s not worth it. Return home and eat your peanut butter with a spoon. Scenario Five: Your sister wants to borrow your favorite book (with the creases at all the best parts.) Last time she borrowed a book she got barbeque sauce on it, and put it in a bag with a leaking bottle of contact solution. Allison: Fight. Buy her a new copy of her own so she can experience the book, while protecting your copy at all costs. Maybe say a silent prayer for the sacrificial copy you supplied and hope it survives the ordeal.